Oil on panel, 80 x 54 cm. The sacred and profane come together in these two altar wings from the first half of the 16th century. In a landscape with forests and cliffs, the two kneeling and praying donors are blessed by their name saints. On the left altar wing is St. Augustine in an extravagant, gold-embroidered chasuble, which symbolises his place in Paradise. The saint has his right hand placed on the shoulder of the young donor while regarding him with a merciful expression. On the right altar wing is John the Baptist, wearing a cloak and holding a white lamb and the Bible. 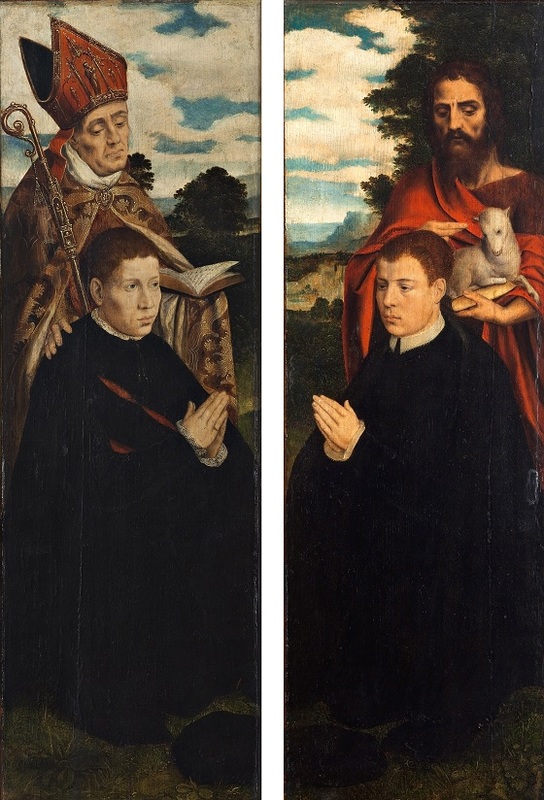 His position behind the other donor shows that the saint is his protector.